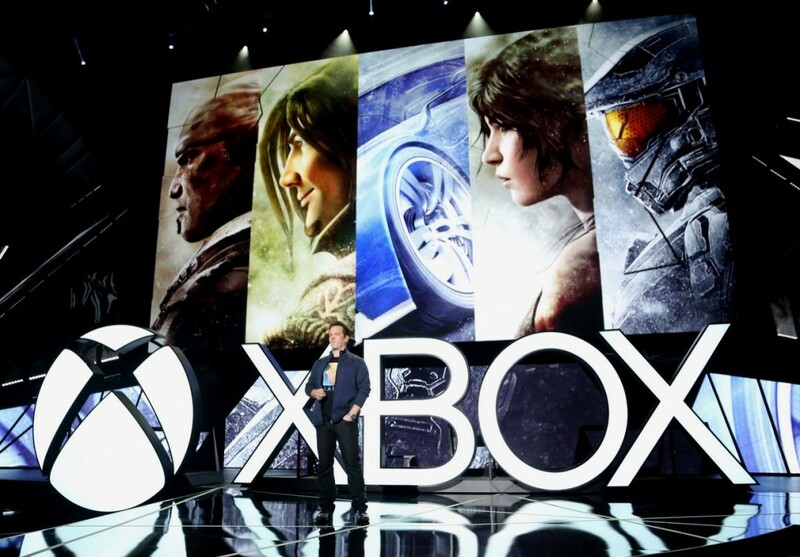 Microsoft took the stage at E3 today, and boy, did they impress, showing off plenty of games and some new features. We’ll cover those new features and accessories in another post and just concentrate on the games here. And there were plenty shown off during the 90 minute conference. There were exclusives like Halo 5: Guardians, Forza Motorsport 6, Rise of the Tomb Raider, and Gears 4. The conference touched on some multi-platform games like Fallout 4, The Division, Dark Souls III, and Rainbow Six Siege, free to play games like Gigantic and Fable Legends, and indies such as Tacoma, Ashen, Beyond Eyes, Cuphead, and Ion. The Gears of War Ultimate Edition was announced today as well as a collection from Rare. Also from Rare we got to see the pirate adventure game Sea of Thieves and we got a look at a new exclusive from Keiji Inafune called Recore. Off we go to the list. First up was Microsoft’s biggest franchise and the newest title, Halo 5: Guardians. The game is said to have the biggest campaign for the series, where you can play as either Master Chief or the Spartan Locke. Each leads a distinctive squad that you can issue commands to. The trailer showed off some solid gameplay, with nice visuals and a nice variety of weapons for combat. The multiplayer is called Warzone, and not only pits two teams of players against each other but pits the teams against AI foes as well. Warzone will take place over several large maps, and looks to be an engaging mode to dive into. Halo 5: Guardians releases on October 27. Next up is a new game, an Xbox One exclusive from Keiji Inafune called Recore. Not much was said about the game, but from the trailer we see a female protagonist on a desert world with a robotic dog for a companion. An attack by robotic spiders leaves the dog down, but the girl is able to take the core from the dog and place it in a larger robot she finds. Could prove to be interesting. Recore is slated for a Spring 2016 release. Todd Howard from Bethesda was on hand to show off some more gameplay from Fallout 4, including a new weapon, the laser musket. Fallout 4 is coming out on November 10. Peter Moore, CEO from EA, unveiled Plants vs. Zombies: Garden Warfare 2, which will have new worlds to explore and new combat. There was even an image in the trailer of a zombie calling down a mech, similar to Titanfall. The game is set to come out Spring 2016. The latest entry in the Forza series was introduced by Henry Ford III of Ford Motor company and game director Dan Greenawalt. The showcase car was the Ford GT40, one of which was lowered down to the stage from the ceiling. The game will have 26 tracks going across all forms of racing, 450 cars to choose from, and 24 car multiplayer. Forza Motorsport 6 hits store shelves on September 15. Not much was shown of Dark Souls III save an announcement trailer from Bandai Namco. The atmosphere looks to be typical Souls, with one very large boss. Dark Souls III is set to come out early in 2016. More gameplay was shown of Ubisoft’s action RPG along with the announcement that Xbox One players will get first access to the beta, which will launch in December. With Microsoft dropping the bombshell that backwards compatability will come to the Xbox One this holiday season, Ubisoft announced the copies of Rainbow Six Siege will come with Rainbow Six: Las Vegas and Rainbow Six: Las Vegas 2 as a bonus. The game releases October 13. Gigantic is a free to play title coming as an exclusive to Xbox One and Windows 10. The game has you match a hero with a guardian to control the battleground. The game comes from Seattle based developer Motiga. A beta for Gigantic is set for August. In addition to announcing Rare Replay, a collection of 30 classic games from the developer Rare which will retail for $30 (coming out August 4), studio head Craig Duncan also revealed the shared world adventure game Sea of Thieves. The game has you play as a pirate, with plenty of islands to explore and sea combat to engage in. We got to see more gameplay from Lara Croft’s next adventure, showcasing a treacherous climb up a mountain in a snowstorm. We also got a glimpse of the other environments Lara will be visiting, along with a release date. Rise of the Tomb Raider hits stores on November 10. The free to play game got a new trailer. Look for it this holiday season. Two announcements came from Coalition studio head Rod Ferguson on the Gears franchise. The first was for Gears of War Ultimate Edition, which remasters the first game of the series for the Xbox One and is set for an August 25 release. The second announcement involved the newest title in the franchise, Gears 4. The trailer showed off some gameplay of JD and Dawn tracking a creature through some ruins. Gears 4 is set for a Holiday 2016 release. And there you have the major releases coming to the Xbox One. What are you most excited about? Let us know in the comments below, and stay tuned for more from E3 2015. This article is originally written by Thomas Juretus, a writer at Leet Gamers Asia. It is republished with permission.